Where Will the “I Spy” Quilt Go Next? 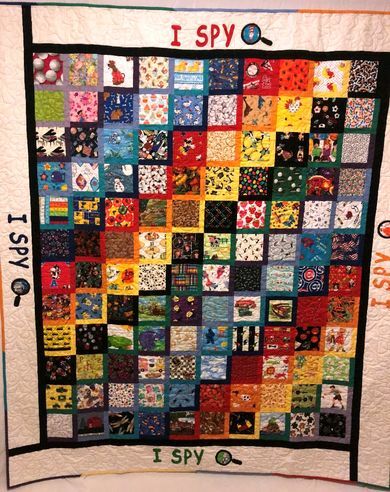 Pictured is a section of the 2019 DuBois Raffle Quilt “I SPY”, made by the Happy Quilters of St. John UCC, Mascoutah. Based on the popular books of picture riddles, the quilt has 120 different fabrics, which only adds to the challenge of finding the hidden objects. It is 70 x 80 inches of fun! Tickets are $1.00 each or six for $5.00 and all proceeds go to DuBois Center. Click here for tickets that you can print and mail to the church. St. John UCC, Mascoutah matches all money that the Happy Quilters raise, so each dollar you donate is two dollars for DuBois Center. Members of the Happy Quilters have already been out visiting area churches with the traveling quilt. They were just at St. Paul UCC in Lebanon this morning!